Those clever people at Collecta, a renowned manufacturer of prehistoric animal models, have created a little scene to celebrate the introduction this year of the Ichthyovenator dinosaur model. Fossils of this bizarre Theropod have been found in Laos (South-east Asia). It is believed that this Spinosaur specialised in hunting and eating fish. 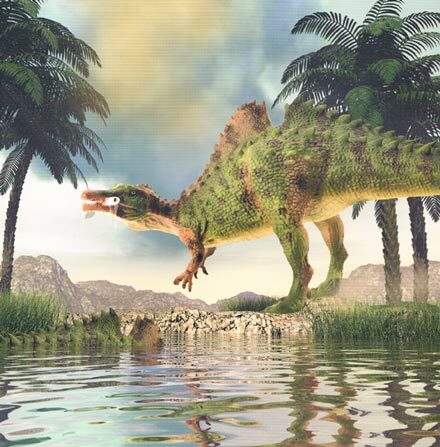 Collecta have created an image of this dinosaur model, fishing by a body of water. A prehistoric scene featuring the Collecta Ichthyovenator dinosaur model. Palaeontologists believe that this substantial dinosaur was a piscivore (fish-eater), however, this large Theropod probably was a generalist feeder as well, hunting other dinosaurs, Pterosaurs and other reptiles. It’s a great image and if we are not mistaken, the new Collecta palm tree is featured in the background. If you look carefully you can see that an Ichthyovenator is actually in the water, just the strange notched spine is showing above the water.